This broad spectrum combination of minerals, vitamins, and herbs is formulated to aid in the formation and strengthening of the skeletal system. It provides highly bioavailable forms of calcium, a mineral essential not only for the maintenance of the functional integrity of the nervous, muscular, and skeletal systems, but also cell membrane and capillary impermeability. This formula also provides substances which nutritionally support and enhance the absorption of calcium and the incorporation of calcium into bone. In addition, it provides nutrients essential to healthy bone structure and formation, the synthesis and strengthening of connective tissue in cartilage and bone, and the formation of elastin. Ipriflavone, an advanced addition to this formula, is a synthetic derivative of naturally occurring isoflavones. It supports healthy bone maintenance by promoting secretion of the hormone calcitonin, and maintaining healthy osteoclast activity. 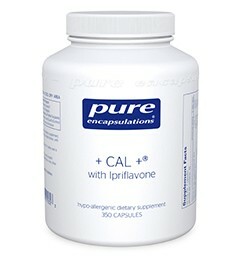 Ipriflavone also supports type I collagen and the formation of mineralized bone matrix. Vitamin K enhances bone formation by carboxylating osteocalcin. This enables osteocalcin to bind to calcium and promote healthy bone mineralization. Furthermore, +CAL+® is enhanced with 1,000 i.u. of vitamin D3 for optimal bone health. +CAL+® combines the nutritional elements necessary to strengthen the skeletal system and resist the onset of osteoporosis. vitamin D (as cholecalciferol) (D3)1,000 i.u. ascorbyl palmitate (fat-soluble vitamin C)102 mg.
2–7 capsules per day, in divided doses, with meals. 65 points will be rewarded to you when you buy this item. Earn free products. Click on the green "i" for more information on our rewards program.